I checked out l'atelier de joel robuchon for a nice Saturday lunch with the family. I've been to robuchon a galera last year and thought the food was a little hit and miss, so was eager to try out the Hong Kong branch to see how it held up. They charge $200 per head extra if you sit at a table so it was a no-brainer that we opted for bar seating. Not to mention, this way you get full view of the open kitchen :) All of us ordered the 3-course menu at $420 - plenty of food for lunch. The complimentary bread basket came piping hot and was absolutely irresistible. I tried their flute baguette (my favourite), a soft walnut bun, and that bread at the back full of cheese and ham. All slathered in soft, spreadable butter. Mmm. I really enjoyed this one, though I was quite surprised that they would offer an amuse bouche of zucchini cream and onion when zucchini was one of the choices for starters. Luckily I didn't order the zucchini so I happily lapped this one up. The zucchini appetizer came with (from left to right) tomato mozzarella, eggplant caviar, and egg in "mimosa" style (sort of like devilled eggs). I didn't try any of this but the presentation was beautiful. Mackerel looked amazing and I almost wished I had ordered it myself. Taste-wise, very nice. It was lightly seared and didn't taste overly fishy or salty. My choice of main course in a French restaurant is almost always duck because the French definitely do it the best. This classic duck a l'orange did not disappoint. The roasted Challans duck breast was perfectly tender with a strong ducky flavour and just a hint of nuttiness. It paired most beautifully with the orange reduction. Mashed potato was served alongside my duck and arrived looking like butter, probably because they used so much of it to make this deliciously creamy mash - you can see how it glistens! I wanted to lick the bottom of my bowl it was so artery-cloggingly good. These frog legs my aunt ordered might actually have been even better than my duck. Simple roasted frog legs served with fava beans, they tasted quite mild but had an excellent crunchy exterior reminiscent of the Chicken Man's amazing chicken wings. The iberico pork loin was my least favourite out of the mains, but only because the others were so good. The "teriyaki" sauce was just a little too strong for my liking and the pork was pretty standard. 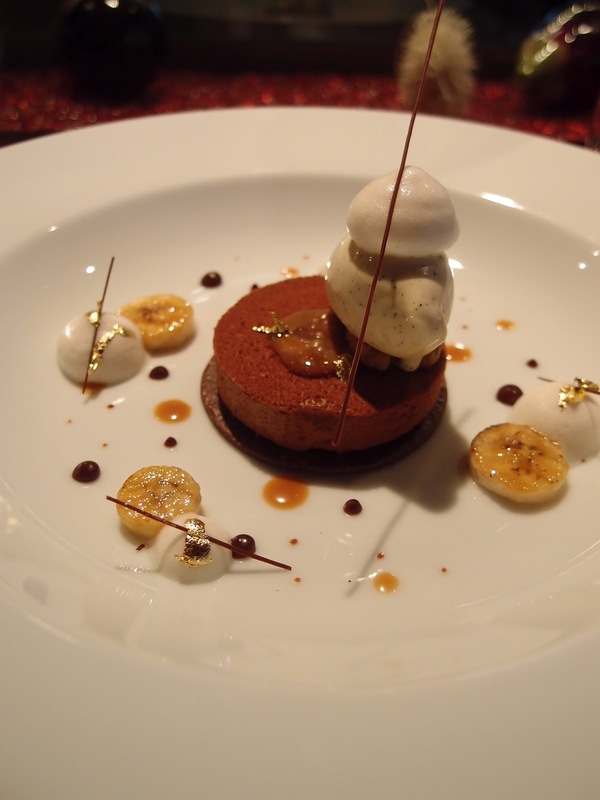 A chocolate caramel tart served with caramelized bananas and vanilla ice cream. I didn't taste any of this dessert but judging by how quickly my dad wolfed it down, it must've been good. Very inventive tiramisu! I didn't eat the crackle at the top but the rest was delicious with a very rich coffee taste. Madeleines, macarons, chocolate and jellies - what more does a girl need? :) The madeleines were delightful and probably the best one I've had in Hong Kong (with the only other contestant being Monsieur Chatte :P). I wonder if they sell them in the Robuchon cafe downstairs? I was too full to attempt the rest of the petits fours - the dishes came out with surprising speed so there was little time to sit and digest. 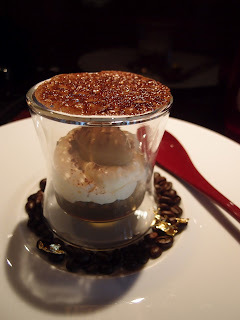 I even had to pass on the coffee/tea, though I know Robuchon makes a killer cappuccino. 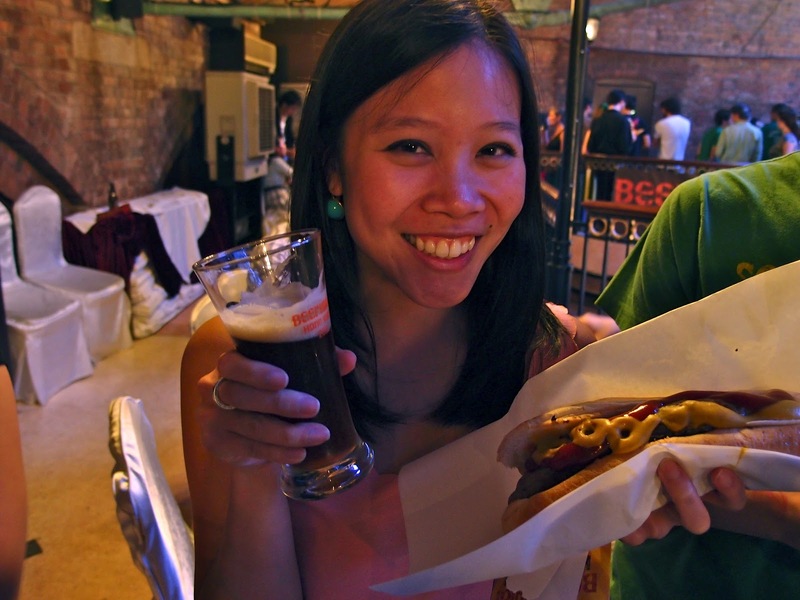 Despite our satisfied bellies, we continued our day with a trip to Beertopia for beer and hotdogs! The event was hugely successful and I had a great time with my beer - I sampled fruity apple beers from Belgium, dark wheat beers from Germany, a delicious hazlenut nectar from the US and many pale ales from the UK. The best though was this wheat beer from Japan though I forget the name already :( Too bad the hot dog was far too salty! Not worth the $120 it cost! !